The new ‘Salted Camel’ is a salted caramel gelato made using camel milk and topped with butterscotch baubles. Gelatissimo Product Development Manager, Filiz Kaya, said the gelato is an ideal Christmas flavour. 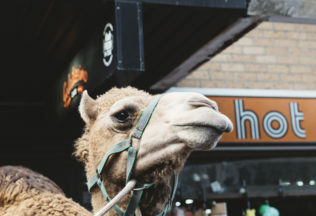 “Australia has gone mad for rich, buttery, caramel flavours so when I first tasted camel milk, I just knew it would be the perfect ingredient to incorporate into a delectable, Christmas time flavor,” Kaya said. Salted Camel uses camel milk from the Hunter Valley that is described as smooth on the palate, a little sweet and containing a slight hint of salt. The gelato flavor is available now for a limited-time leading up to Christmas. Gelatissimo is a global franchise brand with 43 stores in Australia and 17 internationally. Founded in 2002, Gelatissimo is 100 per cent Australian owned. The company has grown into one of the largest gelato franchises in the world, establishing the brand in Australia, Singapore, Philippines, Kuwait and Saudi Arabia.